Dear Readers. I should be promoting this novella, but I'm sort of avoiding you. The reason is...I feel kind of bad. 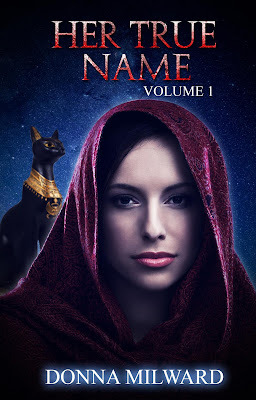 Yes, 'Her True Name:Volume One' is available for purchase, but...There is an issue concerning formatting. It started with a conversation between Sage and the Energy in the prologue. The original version has the Energy speaking in a stunning Papyrus font, and that's what created the problem. You see, Createspace doesn't accept any font other than Times New Roman. So it just ignored the font, and replaced it with Times New Roman. I've been trying to fix it since. Yes, I am aware that I can 'embed' the font, but no, I'm not smart enough to do it. It may as well be math, because that's what it looks like to me..
You know what irritates me? In highschool I had a 92% average in computers. I had a decent grade in typing too. Flash forward a decade or so without using either, and here we are. Everything I learned in highschool computer class is utterly obsolete. I type with two fingers, and I require hands-on help to do the simplest task on my computer. I even needed help to start this blog years ago. Did you know I can't even take a screen shot? I have to pay Heather Savage to do my formatting, because I can't do that either. I'm digressing. Anyway, my point is, I've made several attempts to fix the problem, but I think I'm making it worse. My novella looks like it was written by a hack. Okay, maybe not that bad, but that's what it feels like. If you'd read any of my stuff, you know I can write! Right? My big fear is that readers will check out the first chapter of an otherwise decently written novella and say, "Oh for God's sake! This woman can't write! Look at the errors!" Ugh...I'm so sorry. But I've learned many valuable lessons from my first messy stab at self-publishing. Painful ones that will stick with me a loooong time, so please bear with me. I've still got more books in me--Like Volume Two of this series, and 'Elaina's Fate', which bring me pleasure to compose. I'm hoping to get 'Chasing Monsters' out next, time and finances willing. If you hang with me, I promise to give you villains to hate, characters to love, and adventures in mythology and reincarnation. Hey! Hope you all had a Happy Canada Day! So...I did this thing since the last time I posted. 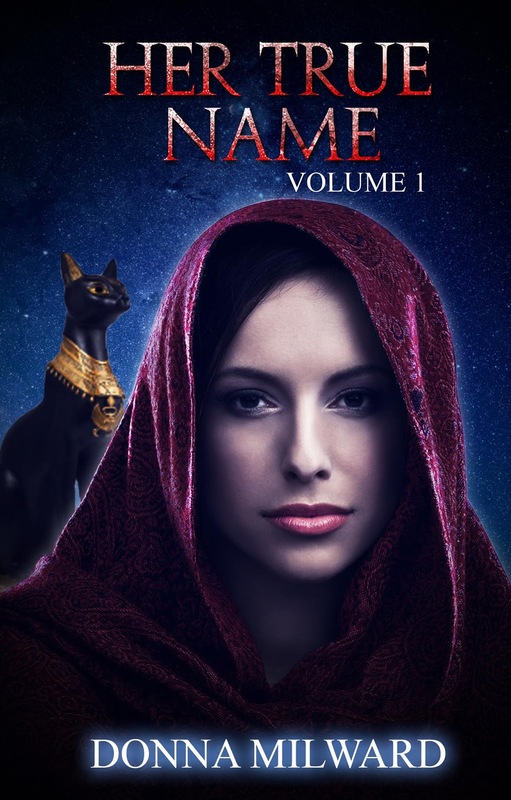 I published 'Her True Name: Volume One'. Sorry I didn't tell everyone sooner, but I've been waiting for something ELSE to go wrong. (Thank you Heather Savage and Kathy Steinemann for your endless patience.) It didn't, so here we are...HER TRUE NAME: VOLUME ONE Finally!! As you will notice, it's e-book only in the U.S. That's because it's only twenty-five thousand words. Hardly worth printing. Also, it's a series, and since I don't really know how many installments there will be, I can't expect readers to buy them all at an escalated print-out price. After all, it starts in ancient Egypt and ends this century. The bad news, is that it's ONLY available through Amazon. The good news is that's because I signed up for Kindle Unlimited. Think of it as Netflix for books. You pay one price, and you can read as many books as you like for the month! That means my other novels and any others signed up for KU. I also signed up to Amazon's terms because they'll take care of a lot of marketing and promotions for me. You know...The stuff I HATE doing? We'll see how this goes. Right now, I'm just really relieved things are going well. Oh, and if you don't want to sign up for Kindle Unlimited, my novella is still available to all. You might wish to wait until Amazon puts it on special. CORRECTIONAL NOTE: Yes, this book is available in Canada through amazon.ca. Sorry, I should have mentioned that. I think it's international as well. Would you like an excerpt? I hope you like it. Salvia swallowed her trepidation and forced herself to calm. She was never good at hiding her emotions, but she would have to learn if he was to come to her home every day. She picked at the folds of her garment, trying to present herself as tidy as possible. She wore white. Her jewelry marked her importance as lady of the house, with her hair up, bejeweled in gold scarabs. He would respect her importance. Salvia nodded. “Bring him to me.” Her stomach dropped the moment her maid turned her back. Why did her knees shake? What was wrong with her? Too quickly the servant returned with Theophrastus, and Salvia found herself gifted with amazement. His clothing was washed and white, no longer dusted with memories of his long journey and in good repair. His hands were clean and his head shaved. His demeanor suggested supplication she hadn’t expected. She caught her breath at the sight of him, remembering his naked torso glistening in the moonlight, how his song touched her now racing heart. It was unlike her to feel this way. It excited and mortified her. “I am aware of that.” Salvia couldn’t bring herself to let her guard down. He was only being contrite because her husband hired him. His pleasantries were meaningless. The gods must be playing with her. Where did this sudden change of heart come from? Worse still she knew she would relent. I'd also like to tell you Volume Two will take place in Uppsala, Sweden, in the time of the Funnel-beakers. I hope to have that one out next year, barring any other 'glitches'. Enjoy!